Whenever there’s a HootSuite release, new industry tip or an excited HootFan, we aim to be the among first to hear about it. Why? Because some of the handiest solutions and tips come from you – our Owls. After reaching 2 million users, we took a step back to see what the web world was saying about HootSuite. What have we done right? What can do better? From mainstream news to the everyday blogger, we enjoy reading how you’re using HootSuite in your daily life. 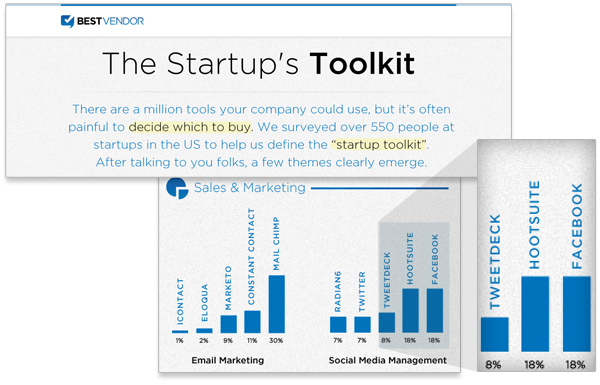 As seen in the image above, we made the grade as a the choice of start-ups for managing social media in Mashable infographic with research BestVendor. As you’ll read, we’re in some great company. The folks at BestVendor surveyed 550 startup staffers — most in marketing and executive administration positions — on their favorite tools for email, accounting, web analytics, CRM, productivity, design, storage, payment processing, operations and so forth. So what’s hot among startups these days? Google Apps, Google Analytics and Quickbooks each garnered a majority of the votes in the email, accounting and web analytics categories respectively. Salesforce bested its CRM competition with 59% of respondents selecting it as the application of choice, and consumer-friendly Evernote proved hot with startup types too in the note-taking category. The Young Entrepreneur Council, a site dedicated to teaming up young entrepreneurs with mentors, featured CEO Ryan Holmes‘ remarks explaining how to tap into your social networks and monitor your brand. An exploration of our technical plan in the cloud features quotes from CTO Simon Stanlake about how we’ve used the AWS EC2 to build and scale quickly. Using HootSuite, you can manage your Facebook and Twitter accounts within an elegant, clean user interface. HootSuite stands out from other social network managers for its extra features: you can schedule updates, set columns to monitor keywords and hash tags, and translate updates in other languages. Social media dashboards are the ideal solution for small businesses that are already pinched for time and money. They can simply open up a single application to check for comments, updates and mentions on a variety of social media. HootSuite allows you to manage multiple Twitter accounts at the same time. The dashboard displays all your accounts on one page to make tweeting, retweeting and direct messaging easier than ever. Gone are the days of logging out of one account and into another just to post a tweet. You can choose to post something to one account or all of your accounts. You can even add administrators so other people in your office can post to the accounts of your choice. Raise your hand if you have a Twitter account. How about a Facebook page? Very good. You can put your hands down now. Now raise your hand if you have A LOT to say but don’t want to overload your followers … you know, give them bite-size information on a frequent basis as opposed to the whole enchilada right off the bat. There are A TON of features offered for FREE over at HootSuite besides simply scheduling tweets. What is a group of owls called? Go on, take a guess. Give up? A parliament. Cool, huh? If and when our readers decide to become “one of the parliament” of HootSuite users, they will be able to choose from one of (3) current color schemes to view their custom streams. What separates a shiny red ball from someone useful is function. How does any given tool help you? Does it make you money? Save you time? Make your life easier? What it does: HootSuite allows you to manage all your social media sites in one place. Plus, there’s all kinds of fun data and metrics to make sure you are maximizing social media. See also: Interview with CEO Ryan Holmes from the same site. 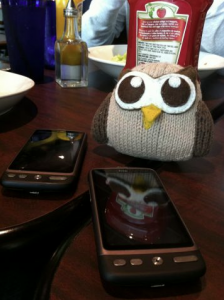 HootSuite shared some social media luv with Tech Uptown – a series of events in US urban centers like NYC, Chicago, DC. The next one is coming quick on Friday in Atlanta. We heard (HootSuite user) CNN will be there, will you? At the June #TechuptownNYC event at Aloft in Harlem hosted by L Martin Johnson Pratt (aka: @iluvblackwomen), the crowd enjoyed HootSuite beverage coozies and stickers to go along with the networking and other sponsors CrowdBooster.com, and Hashable.com. We understand that it takes a lot of time and effort to research and write about a topic you’re interested in. Every review, recommendation and study that finds its way into the HootSuite nest gets a big THANK YOU. All your remarks help us grow. See the “firehose” of news, follow @HootWatch and explore the HootSuite social bookmarks.Remember: If you’re dealing with any glitches or road bumps in your account, we’re here to help. For starters, check the articles on the Help Desk or ask on Twitter via @HootSuite_Help.